Instructions: Finished card size is 7" x 5". Using rectangle dies cut a 7" x 5" panel from green cardstock and a 4 1/4" x 5 1/2" panel. With coordinating die cut a panel from patterned paper, ink edges with broken china ink and glue to green cardstock, glue panel to base of card. Stamp scene image with olive ink on white cardstock, cut panel to coordinate with smaller green cardstock panel, color image, glue to green panel. Stamp bridge image with coffee ink on white cardstock, cut with coordinating die, color, glue to scene image with foam dots for dimension. Stamp birdhouse with olive ink on white cardstock, cut with coordinating die, color, slightly shape on back with stylus. Stamp birds with black ink on white cardstock, cut with coordinating dies, color and shape on back with stylus. Stamp the following on white cardstock, leafy branches - olive ink, flowers - rouge and rose coral inks, cut with coordinating dies, color flowers with same inks used to stamp images, color leafy branches with twisted citron and mowed lawn inks. 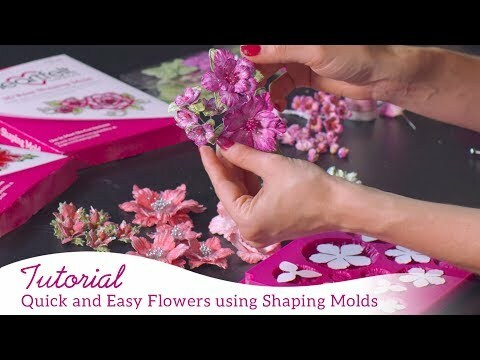 Shape flowers with shaping mold, finish shaping with flower shaping kit. Shape leafy branch with flower shaping kit. Add stamens to all small flowers. Glue birdhouse, branches, flowers and birds as pictured. Add sentiment. Add glitter to flowers, sentiment and river image. Add mini prills to centers of large and medium flowers. Add extra stamen as pictured.